Should the government restrict insensitive commentary? I’m a subscriber to Philadelphia Magazine, and was intrigued by the magazine’s recent cover article entitled ‘Being White In Philly.’ It began with what seemed like bravely honest talk about the uncomfortable race relations in the city. As someone who values open dialogue, at first I was pleased to see the author cut through the typical polite, politically correct language. He frankly discussed issues rarely mentioned in mainstream publications, such as whites’ distaste for discussing poverty in black communities, and blacks’ over-sensitivity and suspiciousness when dealing with white people. I agreed with his premises that treading softly on the subject of prejudice will never lead to resolution, and that one can encounter racism against whites in the black community just as one can find racism against blacks in the white community. But by mid-article, I found the interesting points negated by the offensive opinions of those who were interviewed. I was put off by the author’s negative generalities on race and his wistful reminiscing about how certain Philly communities were much safer when a smaller percentage of blacks lived there. Not long after I had cast the article aside, I was interested to find it in the news again. Philadelphia’s black mayor Michael Nutter sent a letter to the Philadelphia Human Relations Commission, seeking punishment of the magazine for publishing the article. As discussed in my last post, American freedom means respecting the rights of those with whom we disagree, allowing them to voice their diverse or even repugnant opinions, and live the way they choose even when their actions conflict with our beliefs. We cannot slander others with false or purposely malicious intent, but we are all entitled to our opinions. Mayor Nutter, like every other Philadelphia resident, is free to voice his critical opinion about the article. He may publicly denounce the magazine for choosing to publish it. Philadelphians are free to show their displeasure in multiple ways, such as writing letters to the magazine and to local newspapers, picketing in front of the magazine’s offices and canceling their subscriptions. Tolerance will never come by silencing dialogue. But that’s beside the point. Mayor Nutter equates expressing controversial views to shouting ‘fire’ in a crowded theater. He feels speech must be monitored in order to protect the community. Do government agencies need to oversee the media to makesure no one is caused offense? Should we allow officials to suppress voices because we fear the backlash of those who may be offended? When a company spends recklessly, cannot afford to pay its debts, and then asks hardworking taxpayers to bail them out, is that fair? Bailing out corporations in financial distress has recently been deemed a responsibility of government. Not surprisingly, it’s created a great deal of resentment from citizens who don’t want to pay the price of others’ greed or mistakes. Many executives at failing firms used government bail-out money to pay themselves multi-million dollar compensation. Some received over $5 million in pay. The Office of Management and Budget estimates TARP will cost taxpayers $63 billion. But what about a government that spends recklessly, cannot afford to pay its debts, then asks hardworking taxpayers to bail them out? Is that fair? In 2011 we spent $711 billion for defense, double what we were spending a decade ago. That’s more than what China, Russia and the next dozen top military nations spend combined. Our government is borrowing 35 cents of every dollar it spends. In 2012, taxpayers spent twice as much on interest payments as it did on transportation infrastructure, and three times as much as it spent on education. When taxpayer dollars are spent irresponsibly, be it by CEOs or politicians, Americans are straddled with a debt that’s unjust. Americans need to demand honesty and integrity from both the public and private sector. If we’re thinking freely, we know we can’t allow politicians to get away with fraud or deceit that we wouldn’t tolerate from the private sector. In August 2011, Democrats and Republicans promised to work together to reduce future federal budgets through the Budget Control Act. The deadline for this deal was January 2013, two months after the 2012 elections. In the ensuing 17 months, both Democrats and Republicans failed to budge in any negotiations, delivering on none of these promises. But if shaving such a small percentage from this year’s budget seems so arduous, how are we to believe that our representatives ever intended to hold up the bipartisan agreement in the first place? Why is such a minor reduction so difficult? 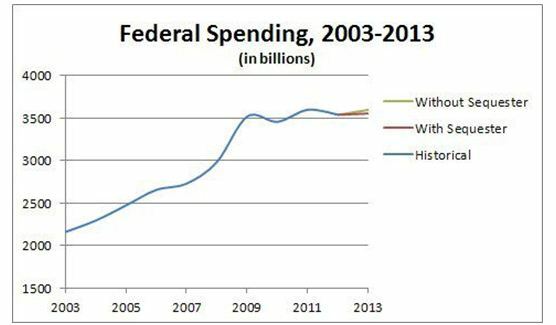 We’ve been warned of the major effects the sequester cuts may produce. Supposedly branches of the military will be cut to the bone, we’ll be waiting for hours to go through airport security, national parks will shut down, etc. What neither Democrats nor Republicans are explaining is that more than two-thirds of federal spending is labeled “mandatory” and isn’t on the negotiation table. To maintain this constraint, we’d have to nearly shut down the rest of government to actually balance the budget. Compare the situation above to the following: Ford offers a car that will get 50 miles to the gallon. After deciding to purchase it, you learn the car actually has the same mediocre gas mileage as your old car. When you complain, you’re told by Ford’s president that you were dumb to expect a car to get that kind of mileage. But if you insist, he’ll take the doors off to get the mileage down a bit more. As discussed in my previous post, it’s as unethical for a politician to make promises he can’t keep as it for is a businessman to do so. In fact, ethics in our public sector is even more crucial, since we have no choice but to pay for the things our legislators pass into law. That’s my opinion. Let’s hear yours.